Rationalist Judaism: What Will They Do About It? It was hard and painful to read the article by R' Kapler about married children who are dependent on their parents. However, how interesting it is that the parents are giving their children a personal example [of being dependent on their parents]. We can say this, the children did not invent this, they saw their parents doing it. You [parents] who are now complaining did (and some are still doing) the same exact thing! Your parents, holocaust survivors, could not bear to see their children lack from anything, and therefore gave (and are still giving) to you everything they had. The generation of holocaust survivors worked like mules, some in physically and spiritually crushing work, and along with the reparations they received from Germany married off their children, bought them apartments, helped them move to bigger apartments, etc. giving whatever they could and sometimes even more. The second generation worked much less, most learned in kollel (some are still learning in kollel) and live off government and kollel stipends, and help from their parents. So when they came to marry off their children they found themselves in a hopeless situation and took their children and threw them into the turbulent waters. The children who were used to their grandparents being the source of all good, are coming back to take. Sometimes the tray of chickens that they take from the freezer are the only chicken the grandchildren will see that week... because when there isn't any, there isn't any. Parents, it is your fault! If you don't provide your children with the tools to make a living and you provide an example of living off the taxpayer, you can only blame yourselves. The fact that Mishpacha published three letters in favour of the article (these are the only letters published) says a lot about what is going in the Charedi community. At least some people seem to understand that there is a real issue here, the question is, what will the leadership do about it? It's difficult to talk about the "leadership", because it's not clear who the leadership of the charedi community in Israel actually is. Is it the Gedolim, the politicians, or the askanim? But the answer to the question of what the charedi community in general will do about this enormous, overwhelming, catastrophic, and ever-worsening problem is this: they will try their best to make it even worse. In the forthcoming national elections in Israel, the charedi community will, for the most part, be voting for the charedi political parties. The overriding goal of these parties is to obtain as much money as possible for people in kollel, and to oppose efforts to give charedim the educational tools and incentives that they need in order to integrate them into the workforce. This will temporarily alleviate the catastrophe described in Mishpacha - but when the money runs out, as it eventually must, and the charedi population has meanwhile grown all the more, the catastrophe will be all the greater. The charedim are their own worst enemy. The bitter answer is likely the correct answer: For three generations Chareidi leaders have created a society they consider "perfect" and the only option for a Torah-true Jew. How can those leaders now implement change when such change implies that the current arrangement is less that perfect? Therefore they will continue to insist that there is no problem, that it's the evil Israeli government that's the problem and therefore it's the government that has to change, not them. And things will get worse, the OTD rate will skyrocket and Jewish children will go hungry in a land of plenty by choice. I dont understand why you dont follow the argument through to the obvious conclusion. You know full well that both Likud and Labor will be happy to make a coalition with the Haredi parties and will ensure the Haredi parties get their hands on the money. The only answer is to vote Yesh Atid. The are the only party courageous enough to stop this rot. Let's leave that discussion for a future post. Looking forward to the future post. Just some food for thought for your consideration while you think about writing that future post. Voting for Atid just because they want to punish haredim and eliminate further the kollel stipends will NOT solve the overall problem described in this post and would be short sighted. There is no guarantee that voting for atid will get them enough seats to even sit in the coalition, let alone lead. And many of us find them weak and incapable on many issues. Frankly, I do not care about yeshiva stipends. It's a drop in the bucket compared the huge welfare apparatus upholding the kibbutzim, the arabs and their huge impoverished families, the water and electricity and other supplies free to arabs of gaza as well as the PLO, etc! Nor would Likud as the leading party contribute toward perpetuating the problem. The likud govt already lowered stipends and put in a draft. Bibi used lapid and his brief flash in the pan popularity to be able to form a govt without haredi parties to implement those changes. The changes were made there. The amount of the stipends is likewise a drop in the bucket for kollel families and their needs for weddings, children, grandchildren, apartments etc. The problem exists with or without the little stipends. It's a massive societal ponzi scheme that is unsustainable and the stipends don't make a difference now. Please.... Bibi did not use Lapid to form a government without haredi parties... he had no choice. he hated it. he couldn't wait to get rid of lapid and to get the haredim back so he could have a quiet life, protect his seat and all at the cost of a few billion shekalim of taxpayer money. and if you don't believe me, then you can ask him yourself in english.. I really can't grasp the huge Yesh Atid fans out there. The party was very well positioned to do all the things you claim are good. A stable coalition with no haredi parties, working on equalizing the draft, etc. etc. They actually accomplished a bit. (Why you can't acknowledge what Bayit Yehudi did and does is beyond me. The sole anti-draft troublemaker has quit to join Yishai, and good riddance.) And then Lapid decided he couldn't play nicely with others and decided to get all vocal about spending, gays, Yisrael haYom, and Arabs. And of all things, he's gone and lost all his *left-wing* support, while for some strange reason a few religious commenters seem to be the only Israelis left who think he's the cat's pajamas. The only real hope is many, many seats for Likud and Bayit Yehudi, and hopefully the complete disappearance of both Deri and Yishai. Regarding the "free electricity for Gaza" matter, I heard an interview on Israel radio by someone who explained that one of the main reasons that Israel doesn't make an issue out of it is that supposedly the Gazans purchase so many Israeli products that far outweigh the amount they owe on electricity that it is worthwhile for Israel to allow this outrageous situation to continue,. Moshe Feiglin advocates a volunteer army, which would dramatically change the work prospects for the hareidi community. Unfortunately though, Feglin is a long way from having any of his policies implemented. And I don't see Bennet as the Saviour because all he did really was to take care of the Hesder Yeshivot and the Settlements. If people feel let down, then it should be because of him. His campaign was all about uniting the religious and the secular (he's an 'ach')... but his party did nothing at all in that direction. Such a wasted opportunity. 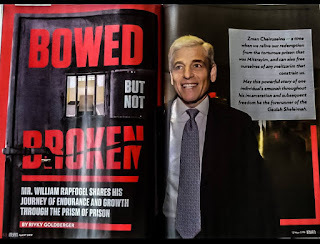 I think Yesh Atid started off with good prospects and good rhetoric, but that ultimately Lapid either intentionally or negligently knocked its chances off the rails by alienating the kharedim who wanted to work with him and using to much stick instead of carrot. This isn't about justice--of course it is unjust to live off of taxpayers when you shouldn't need to (voluntary impoverishment)--it is about practically reality and how you can actually move the kharedim to where the Jewish people and Israel need them to be. [Godwin Alert]. 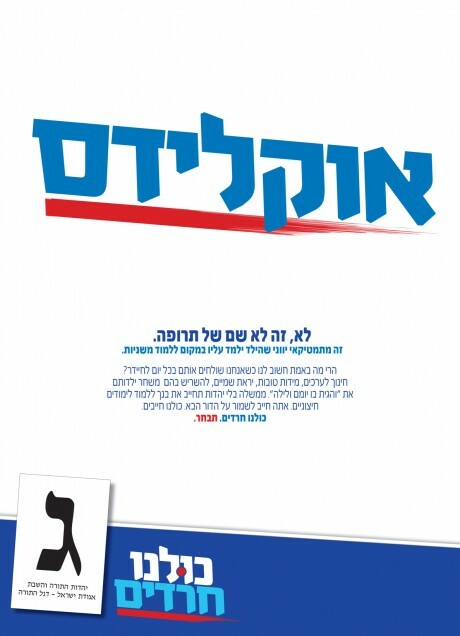 The "Vote Gimel" ad calls geometry "Greek mathematics". That brings to mind the notion of Jüdische Physik (Jewish Physics). I don't share your gloomy prediction. My father's cardinal rule about Jews is: We aren't stupid. The shift, over the past ten years, toward a greater understanding of the parnassah crisis has been enormous. It will be doubly so over the next ten years. People will do what they can to move their families away from poverty and toward parnassah if they see an acceptable model. Those models, which are being built (perhaps too slowly), will gain traction and eventually snowball. But social engineering by fiat will not work, and the teasing and gloating by certain sectors of the dati leumi community will not encourage change. By your admission the crisis has been recognized for at least 10 years. And very little has been done by chareidi "gedolim" to deal with this reality. Translation: We are on top of this. We are working on it. We have a plan. In the meantime, don't discuss it, embarrass or upset us; just hand us your money and all be well. Who says Jews aren't stupid? We managed to lose national independence twice, both times through circumstances that could have been avoided. There were some stupid revolts that failed after that too. While the Holocaust was, well, the Holocaust, certainly there was a lot of stupidity during that period that made things worse. Almost every war Israel fought has involved liberal helpings of stupidity that didn't help things. Israel's had many, many problems that can be chalked up to stupidity, and since the early 90's has stupidly pursued the very stupid "peace process." Meanwhile, diaspora Jewry has been very stupid in failing to preserving itself while stupidly worshiping the molekh of the Left. Another way to look at this cognitive dissonance between the "obvious projections" bderech hateva is to assume the chareidi leadership is well aware of derech hateva but feels that by acting with emuna on what they understand to be the will of hkb"h, he will continue to intervene to keep their approach viable. One might argue that a subset of the national religious camp had a somewhat similar approach to the withdrawal of Israeli sovereignty from gaza. Unfortunately your "brilliant" analysis is elementary. Yet for some reason most people still can't figure it out. As you well know, there is more than one issue in every election. There's the economy, but there's also national secuirty (and other issues). Some people believe Netanyahu is better for national security than Lapid. Not ignoring you.. just respecting the blogowners request. Sorry. No problem. Thank you for being so courteous. are there any forthcoming blogs about "Rationalist Judaism" or will we continue to receive the "Rationalizing why I am no longer part of charedi Judaism". it seems an uncanny amount of your efforts here are to point out everything fault you can about one community. Perhaps you can spare some time to write something we could actually make birkat hatorah on i.e. explore the legacy of medival scholars or the sort. Nah, that takes actual scholarship. This is much easier. Place a name Rational on the top, and hey presto - everything underneath is 'rational by fiat'! I tried to respond in the earlier post, but it was not put up here. I know that you and your wife have tried very hard with your boys and that you are good and well-meaning people. I did not mean to insult you and I apologize for doing so. Your comments were very critical of Charedim. I don't understand why Passaic residents share much in common with an Israeli Mishpacha magazine article about Chasidim in Bnei Brak, and I made a sarcastic comment implying that you should worry about your own family before attempting to find fault with everyone else. At this point, my comments are irrelevant. Although he publishes comments like this... That says quite a lot. i can attest that the number of charedim not working is totally incorrect, almost all families have at least on parent working, even most avreichim have something on the side whether it be tutoring, real estate brokering, editing etc... the statistics are often misleading as they report working people with registered businesses. Unfortunately, in this country many many people work under the table. when I bought an apt. i used a charedi lawyer, a traditional settler as a contractor, a mizrachi carpenter, and a charedi electrician. the only two people who gave me official receipts were the charedim. yes tax evasion is an ongoing part of Israeli life that is a major part of all sectors. the fact is that a growing number of charedim are going to work, just look at prog.com a charedi website devoted to computer professionals, totaling some 22,000. the change should be left as a natural one, any efforts from the outside to force people to work will only backfire that the dying stigma that once reigned against working will be returned. that would be a shame. btw, are there any problems in the modern orthodox world or do the charedim have a monopoly? Nobody is forcing the Chareidim to work, but you can't expect the israeli taxpayer to fund this "natural" change. If the Chareidim want to receive money for schools, stipends for children etc, they have to change faster or at least have leadership that openly calls and directs this change. Even if Chareidim are slowly starting to work more(which I am skeptical about), I still want to hear it from the gedolim that working is a good thing for the vast majority of Chareidim and all chareidim should be educated in some parnassah by the time they are 25 so they can properly support their family. I have not heard the gedolim say this publicly, so therefore I don't accept that we should just sit back and wait for natural change to take place. They can't be forced to change physically, but the society has a right to make it difficult for them not to change by withdrawing funding. When we speak of jobs, we speak of REAL jobs, one capable of supporting a family or at least the bulk of it. Even if true, it is no answer to claim that many charedim tutor or edit on the side. 1. Halevaye that the battle was over Euclidian Geometry, as opposed to basic arithmetic and language skills. 2. כולנו חרדים is a disgusting slogan, because it is styled as an expression of solidarity with the other, which is the exact opposite of chareidi elitism. Let alone the fact that it echoes the slogan of our enemies, ie 'we are all hamas'. It should really be רק אנחנו יהודים. Do you really believe that the Charedim don't have basic arithmetic and language skills? What world are you living on? "What world are you living on?" Dlz, are you chareidi? If so, the point has just been proven. I head the Knesset taskforce to help haredim enter the workforce. The projects which we initiated, including the “All Jobs for Haredim” website, receive an average of 500 resumes from haredim per month as we assist them in their job search and facilitate job placement. Aside from helping these families leave the cycle of poverty, offices and companies throughout Israel are becoming a meeting place between the ultra-Orthodox and secular populations, leading to greater respect and tolerance. Yesh Atid policies relating to the haredi community have yielded one last incredible achievement. More than fifty haredi schools opened this year with basic general studies and the plan is in place to reach 100% of schools which receive government funding by 2018. I have visited some of these schools and these mainstrem Haredi students are thriving. What is it with Yesh Atid's supporters? Sinking ship, jump while you can. What's with Yesh Atid supporter's? I'll tell you what. We support a party that gets things done. We cheer for a party that addresses social issues like the Haredi-Secular divide, or the poverty of holocaust victims, or irresponsible government spending. And frankly, you should too. There is a strange almost automatic way that many people dismiss Yesh Atid. It's strange because when you look at the facts of what they have achieved - it's so impressive. And even more so when you compare it to the almost total lack of achievements of the alternative parties. In all his years as PM Bibi never tackled the issue of Haredi recruitment to either the IDF or the workforce. It was more convenient for him to turn a blind eye. Yet you mock Yesh Atid who changed the law. It was Bibi who created a government with 32 ministers(!) and left a budget deficit of 40 billion NIS (!!!) - and whose main policy proposal for 2015 is a new law whose sole purpose is to keep him on the PM's seat. Nothing at all about caring for the good of the country. That ridiculous seeming ad makes sense in a way. If students in Hareidi schools learn Euclidean geometry they will find that the more ancient Greek mathematicians were far ahead of the Talmudic sages in their knowledge of matters having practical halachic implications. They will learn that the Talmudic 3 is a very poor approximation to pi - being some 4.5% less than the more accurate value, while the then known value of 22/7 is only 0.04% off. They may note that the discussion in the relevant Gemara in Eruvin 14 is based on treating a descriptive phrase in Kings I about the circumference and diameter of a very large temple vessel as a prescription for measuring circles. Even more disconcerting is the evident treatment of the diagonal of a square by the leading Amora, Rav Yochanan, in Eruv 76a as the sum of the sides - despite the general knowledge that it was to be taken as 7/5 the length of the side. Of course, knowing the Pythagorean theorem of ancient Greece would yield the information that it is sq.rt. 2 times the length. However, the general Talmudic value of 1.4 is only some 1% less than the more accurate estimate of 1.414214... Knowledge of algebra, on the other hand, would greatly simplify the student calculations of the shiur of a mikva of 3 cubic amot = 3x24^3 =41,472 cubic etzbaot = 40 seah = 40x24x4 reviit, giving 10.8 cubic etzbaot per reviit - as opposed to the elaborate geometrical arguments used by the Gemara and commentators. Of course, that could also lead to questions of why a young student is more capable of such quick calculations than the sages of old. It could also lead to discounting the large volume shiurim favored in Yeshiva circles. Hence, learning geometry or even algebra could be considered a threat to the ideology propounded by these Hareidi figures, i.e., knowledge and truth being considered a threat to emunah peshuta. It also comes at the expense of students being reluctant to study the mathematical parts of the Talmud since they have not been exposed to such matters, i.e., the tractate of Eruvin then becomes an avoided volume. The flood of impoverished Israeli haredim coming to the United States and knocking on my door to ask for money is overwhelming. Several hundred per year. More than one a day. And it's such an inefficient way to raise money. They have to pay for travel, hotels, drivers, restaurants. Not much is actually left to take home. All this effort to beg for money should be directed towards getting a job that will provide a more stable means of support. Apparently begging is a job that provides a stable means of support. You can help them by not giving and telling your friends not to give. They can go home and you can donate buy bonds from the Israeli government which supports them or to the private charities that do good thing in Israel. I heard a story of a professor of economics who became frum because he went to Mea Shearim and found that it was amazing that the people there could thrive without working. He determined that it must be a miracle from Hashem, so he became religous. Amazing! You should tell that story to the charedim, they think that they need to get money from the government. It's all from Hashem! Sometimes hashem works through r'shaim. Look at the Jews getting money from the miitsrim,. it seems as though most of your readership is not from the charedi world, wouldn't it behoove you, dare I say obligate you to focus on the challenges and weaknesses inside the modern orthodox circles. would that not be a more productive use of energy, perhaps strengthen the jewish community? I think the answer to this question will decide whether or not this site is geared toward improving klal yisrael or just venting your own personal grievances. Perhaps R' Slifkin feels that the future of the Jewish people is at the confluence of the kharedim and MO (remember he originally chose the kharedi path in his spiritual journey). The MO that are close to kharedim have a pretty good balance. But the kharedim just need to get rid of a few crazy things and they will have a good balance as well. Tonight Open Forum in English: Ask your questions to Yair Lapid. If you want to submit questions in advance, Garnel, Nachum, Y. Ben-David and others.. then log in at 8.35 pm and submit your questions on the format there. "It's difficult to talk about the "leadership", because it's not clear who the leadership of the charedi community in Israel actually is. Is it the Gedolim, the politicians, or the askanim?" Oh that's an easy one--the Gedolim. What';s the question?